We are back again in the turmoils of the Sengoku era or, to be more precise, in Mikawa province in the spring of the third year of Tenshō (天正, 1575). Takeda Shingen´s son Katsuyori (武田勝頼, 1546-1582) had marched into the Shitaragahara plain (設楽原) with about 15.000 men and besieged Nagashino Castle (長篠城) because he saw that their supply lines were threatened. Two years earlier, and because of Shingen´s death, Ieyasu had been able to conquer the castle from the Takeda and installed Okudaira Nobumasa (奥平信昌, 1555-1615) as castellan who had before served the Takeda in their conquest of Mikawa province. Instantly Katsuyori ordered the execution of three Okudaira hostages (see footnote 4 of this story) for this breach of loyalty. As Nobumasa was now besieged by Katsuyori, Nobunaga and Ieyasu sent a big force of 38,000 men as support, but it was first and foremost the matchlock guns of the Oda-Tokugawa-Okudaira alliance that had a decisive influence on the defeat of the Takeda troops. Nobumasa fought bravely and defended the castle without any major losses. Impressed, Nobunaga granted him the character Nobu (信) from his name, whereupon the castellan changed his name from the former Sadamasa (貞昌) to Nobumasa. But more important for the latter was the accompanying sword present, namely a masterly Fukuoka-Ichimonji blade (福岡一文字, see picture below) which bore the signature for “one” (Jap. ichi, 一) as it was common for certain smiths of that school. This character – or single more or less horizontal stroke – gave the school it´s name because “Ichimonji” means “character (for) one.” And according to the context of the battle, the blade was nicknamed Nagashino-Ichimonji (長篠一文字). 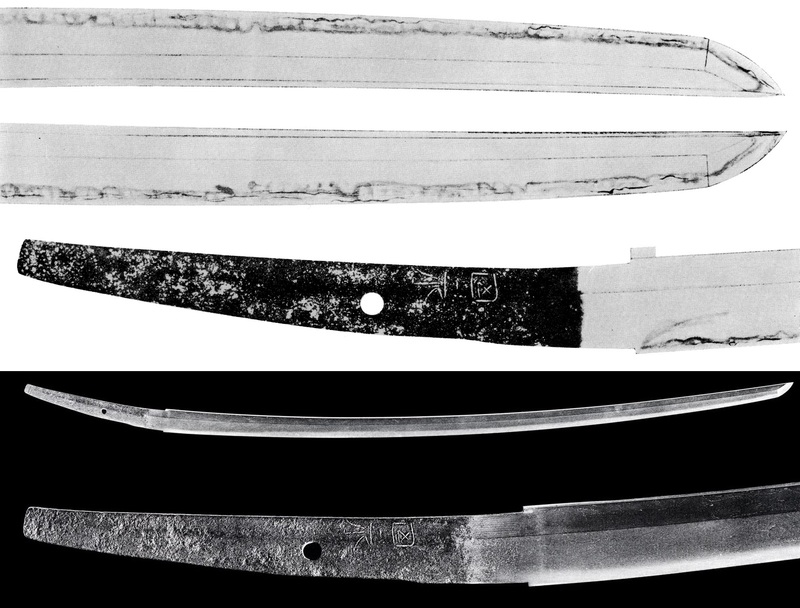 A greatly shortened Ichimonji blade which eventually lost its signature is the meibutsu Nansen-Ichimonji (南泉一文字). It is nowadays designated jūyō-bunkazai and is preserved in the Tokugawa Museum of Art in Nagoya. The nickname of this fine piece goes back to the following tradition. Muneyoshi (徳川宗睦, 1733-1800),*1 the 9th generation of the Owari-Tokugawa family, ordered his sword official to find out more about the provenance of the blade in question. He compiled a report where he stated that it was once owned by the Muromachi-shōgun but does not mention when or how it came into the possession of the Ashikaga family. The latter however had it polished, but when the blade was stored on the sword rack in the polisher´s workshop, an unlucky cat bumped into the rack and was cut in half by the falling piece. This incident reminded the then sword official of an anecdote by the Chinese Zen priest Nansen (南泉, chin. Nánqúan, 748-835). One day the monks around Nansen were arguing about a Zen problem. Nansen grasped a cat, held it up in the air and asked: “If any of you is able to say anything appropriate I will spare this cat. Otherwise I will kill it with my sword.” All the monks were shocked and tried hard to come up with “Zen-appropriate” wisdoms. It turned out that nobody was able to impress Nansen and so he killed the poor animal. When the best student returned home that evening, Nansen told him what had happened earlier. Thereupon the student took his sandals and layed them on top of his head. “If you had just been there today I would have been able to spare the cat!” Nansen knew that his student was deeply enlightened because he had given up all delusive thoughts and forced “Zen-appropriate” thinking about enlightenment. So the blade was called Nansen-Ichimonji and went later by unknown paths into the collection of Hideyoshi who bequeathed it to Toyotomi Hideyori. The latter in turn presented it to Tokugawa Ieyasu in the third month of Keichō 16 (慶長, 1611) when they met in Kyōto´s Nijō Castle. This is how it is mentioned in the sword register of the Toyotomi family called Toyotomi Ke Katana Chō (豊臣家刀帳). After Ieyasu´s death the blade went to Yoshinao (徳川義直, 1601-1650), the founder of the Owari-Tokugawa family, who made it an important treasure sword of this branch of the Tokugawa. The Kyōhō Meibutsu Chō mentions the provenance of the sword as follows: Ieyasu → Yoshinao → the 2nd Tokugawa-shōgun Hidetada → Yoshinao. But the records of the Owari-Tokugawa does not mention this “detour” via Hidetada. Interesting is that the second generation Owari-Tokugawa, Mitsutomo (徳川光友, 1625-1700), had the blade mounted as a wakizashi, that means it was at the latest shortened to its present length during his time. The picture above shows the so-called Nikkō-Ichimonji (日光一文字). The name goes back to the fact that the sword was once obtained by Hōjō Sō´un (北条早雲, 1432-1519) from Nikkō´s Futarasan-jinja (二荒山 神社). Later it came into the possession of the Kuroda Josui (黒田如水, 1546-1604) who played an important role in the negotiations between Hideyoshi and the Hōjō after the defeat of the latter during the Siege of Odawara in 1590. Also listed in the Kyōhō Meibutsu Chō is the so-called Dōyo-Ichimonji (道誉一文字) which received its name from its former owner Sasaki Dōyo (佐々木道誉, 1296-1373)*2 who had helped Ashikaga Takauji to suppress the revolt of emperor Godaigo (後醍醐天皇, 1288-1315). But the tracks vanish after Dōyo until it turns up later in the collection of the Owari-Tokugawa family. Some records say that the family received it as a gift from the Ikeda family (池田) but returned it somewhat later. From the Ikeda it went to the Nanbu family (南部) whose 43rd generation Toshiatsu (南部利淳, 1884-1930) presented it to emperor Shōwa when he visited the former lands of the Nanbu clan in 1928. Today it is still a gyobutsu (see picture below). An Ichimonji blade which bears the signature of an individual smith – namely of Yoshifusa (吉房) – is the so-called Okadagiri (岡田切, see picture below). Yoshifusa was one of the most outstanding representatives of the Fukuoka-Ichimonji school and, according to tradition, was active around Hōji (宝治, 1247-1249). After the Battle of Shizugatake, Nobunaga´s son Oda Nobukatsu (織田信雄, 1558-1630) ended their alliance with Toyotomi Hideyoshi by first choosing an indirect way. When the construction of Ōsaka Castle was finished in 1573, Hideyoshi invited all of his allies to the new stronghold. The primary aim was to find out who was still loyal to him and who was not. When Nobukatsu did not show up this was equal to a breach of loyalty but Hideyoshi did not want to lose this important general and so he requested the Nobukatsu-retainers Okada Shigetaka (岡田重孝, ?- 1584), Tsugawa Yoshifuyu (津川義冬, 1545-1584) and Asai Nagatoki (浅井長時, 1569?-1584) to persuade their lord to attend the gathering. But Nobukatsu saw himself confronted with a supposed conspiracy. On the sixth day of the third month of Tenshō twelve (1584) he in turn invited these three retainers to his castle at Nagashima (長島城), in Ise province, and killed them. According to tradition, Nobukatsu killed Okada Shigetaka himself and thereupon called the blade „Okadagiri“. Later the piece was owned by the Masuda family (益田) who were one of the elders of the Chōshū fief (長州藩). The Masuda eventually presented the Okadagiri to emperor Meiji. Incidentally, the action of executing the negotiators resulted in the Battle of Komaki and Nagakute (Komaki-Nagakute no tatakai, 小牧・長久手の戦い) and with the return of Nobukatsu into Hideyoshi’s ranks. *1 His name is also read Munechika. *2 His actual name was Takauji (高氏). 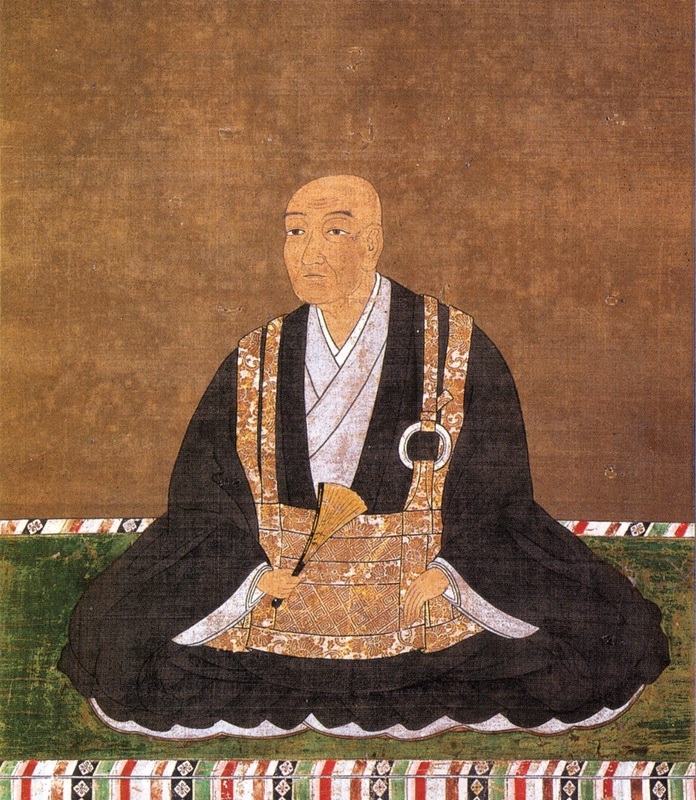 Dōyo was his priest name. 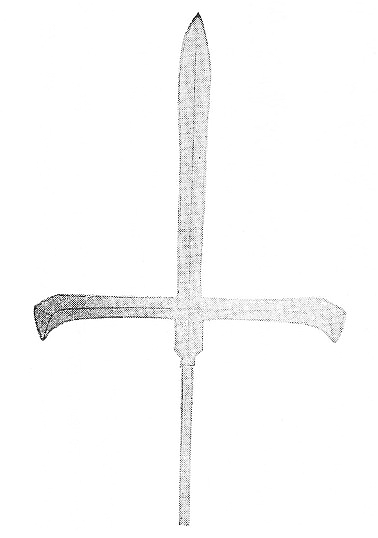 The origins of this sword lie in the Kyōto of the early Nanbokuchō period. The Nōami-hon Mei Zukushi states that rebellious monks entrenched themselves in the Konponchū-dō (根本中堂) of the Enryaku-ji (延暦寺) on Mt. Hiei (比叡山). They had raised a revolt but did not have enough swords to defend themselves so they hired the smith Rai Kunimitsu to come to Mt. Hiei to forge, quasi as an emergency measure, tachi and naginata. The monks were prepared for the worst and so their ringleader tested the magnificent blade forged for him. 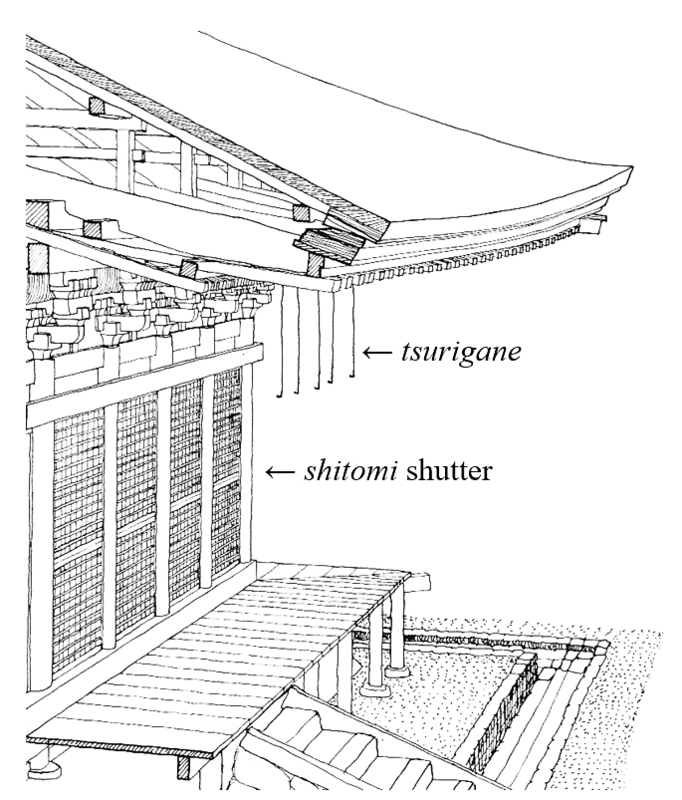 He cut dosn on a metal tsurigane (釣り金・ 吊り金, see picture below) to which the open shutters (shitomi, 蔀) are hooked. It is said that he easily severed the metal hook and thereupon nicknamed the blade Tsuriganekiri (釣り金切り). The extant blade (see picture below) is a shortened katana which measures 63.6 cm. It is unclear if it was handed over to Hideyoshi in this shortened condition or if the shortening was ordered by the latter. But from the wording katana (刀) in the letter we can assume that the tachi had already been shortened to a katana. But katana or tō respectively is a general term for “sword” and so the wording does not necessarily refer to a blade of katana size or mounting. However, after the last battle for Ōsaka Castle – the so-called Battle of Tennōji and Okayama (Tennōji-Okayama no tatakai, 天王寺・岡山の戦い) – the sword was captured from the killed Hideyoshi-general Ōtani Yoshiharu (大谷吉治, 1581?-1615). Yoshiharu was killed by samurai under the command of Matsudaira Tadanao (松平忠直, 1595-1650), a grandson of Ieyasu. In this context it came into the possession of the Tokugawa family and was later presented to the Matsudaira branch, which ruled the Saijō fief (西条藩) on the Shikoku island. This family sold it in 1924 with other famous swords and was then bought by Mitsui Kōshin (三井高進), another member of the wealthy industrialist family Mitsui mentioned in the previous chapter. Kōshin had the blade appraised but received an attribution to Rai Kuniyuki (来国行), the grandfather of Kunimitsu. Kōshin belonged to the Koishikawa branch (小石川) of the Mitsui. He graduated in 1943 from Dartmouth College, New Hampshire, and had remained in the USA even after the attacks on Pearl Harbor in December 1941. In the States he taught Japanese at Yale, Harvard and in Chicago. It was in Chicago where he heared of Japan´s defeat, but he returned some years later to his home country where he became editor-in-chief of the comic magazine “Disneyland” (Dizunī no kuni, ディズニーの国), published by the Japanese Reader´s Digest from 1946 to 1986. The Kyōhō Meibutsu Chō mentions the provenance of the sword as follows: “Present from lord Hideyori to lord Nobunaga´s younger brother Gengorō Taira Nagamasu Nyūdō Uraku (源五郎平長益入道有楽). On the request of [Maeda] Toshitsune and by agency of [Hon´ami] Kōho (光甫), it went later to lord Awaji no Kami (淡路守). But the mentioned sword is now back in the possession of the Kaga lords.” “Awaji no Kami” refers to Toshitsune´s second son Maeda Toshitsugu (前田利次, 1617-1674). When Toshitsune retired in Kan´ei 16 (寛永, 1639) part of the Kaga fief were assigned to his second and third sons. That means Toshitsugu received the newly founded Toyama fief (富山藩) in Etchū province and the third son Toshiharu (前田利治, 1618-1660) received Kaga´s Daishōji fief (大聖寺藩). And in the last sentence of this entry the Kyōhō Meibutsu Chō of course refers to the Maeda family, the lords of Kaga. 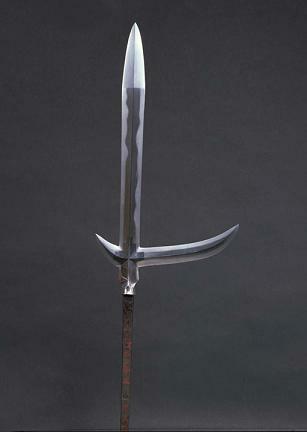 We can only speculate about the backgrounds of this sword presented to Oda Urakusai. Contrary to his older brother Nobunaga, the battlefield was never the home of Urakusai and he was also not greatly involved in the wheelings and dealings of the three great unifiers. Urakusai focused mainly on the tea ceremony and so became a student of Sen no Rikyū (千利休, 1522-1591). He also founded his own school of tea called Uraku-ryū (有楽流). In the 18th year of Tenshō (天正, 1590) he retired to lands in Settsu province worth 2.000 koku, given to him by Hideyoshi. In turn he was ordered by the latter to guard and supervice his concubine and second wife Yodo-dono (淀殿, 1596-1615), who was Urakusai´s niece. 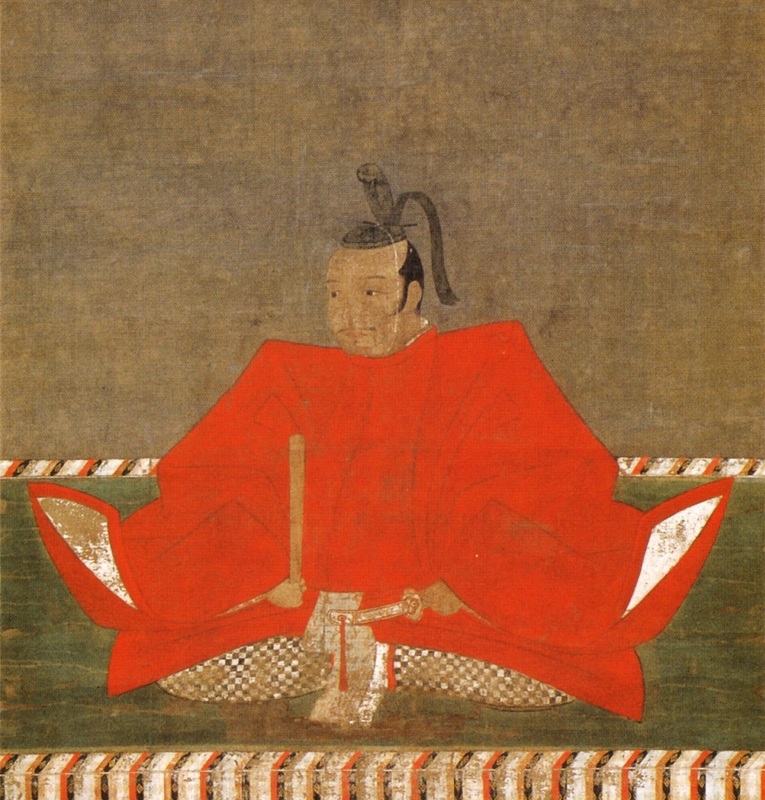 Despite his connection with the Toyotomi, Urakusai, with his eldest son Nagataka (織田長孝, ?-1606), was in the command of force of 450 men belonging to the eastern army of Ieyasu at Sekigahara. It is recorded that Urakusai took two heads during the squirmish. After the battle he again sided with the Toyotomi, but at Ōsaka he joined the side of the more moderate Hideyori supporters. It is not known that Hideyori was an enthusiastic follower of the tea ceremony and so it can rather be ruled out that the presentation of the Rai Kunimitsu had something to do with tea. It was probably a gesture towards Urakusai, to ensure and strengthen the Oda alliance. Anyway, after the fall of Ōsaka, Urakusai devoted himself even more to the tea ceremony in Kyōto. I would like to introduce here another kokuhō blade by Rai Kunimitsu (see picture below). Kunimitsu was, according to tradition, the second son of Rai Kunitoshi (来国俊) and active in Kyōto around Karyaku (嘉暦, 1326-1329). There are dated signatures extant from the first year of Karyaku and the second year of Kan´ō (観応, 1351). The blade in question is a tachi which was worn by Matsudaira Tadaaki (松平忠明, 1583-1644) – one of the numerous grandsons of Ieyasu – during the Ōsaka campaigns in 1614 and 1615. With the end of the Edo period it eventually went into the possession of the wealthy Iwasaki family (岩崎), whose member Yatarō (岩崎弥太郎, 1835-1885, see picture below) founded the Mitsubishi-zaibatsu (三菱財閥) financial clique in 1893. 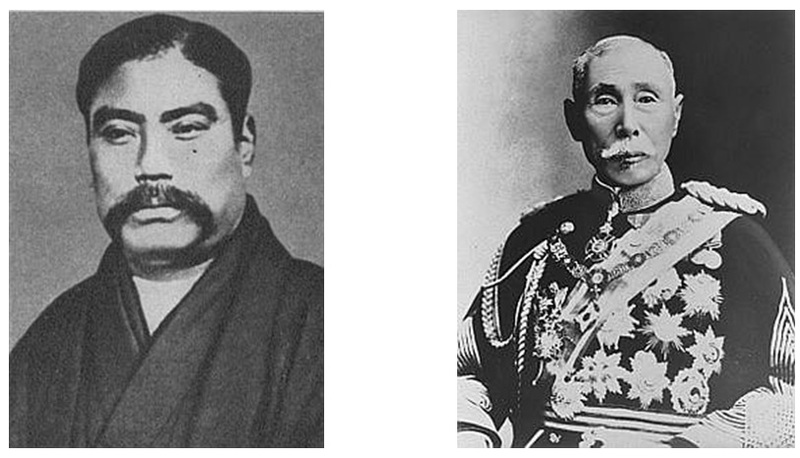 Later the tachi was owned by the polititian Yamagata Aritomo (山縣有朋, 1838-1922, see picture above), a general of the Satsuma Rebellion and the first prime minister of the Meiji Restoration. Aritomo presented the piece to emperor Meiji, who in turn donated it to the Tōkyō National Museum which was founded in 1872. And in 2005, the kokuhō was finally transferred to the newly opened Kyūshū National Museum (九州国立博物). *1 Some sources also list this name as “Yūraku Rai Kunimitsu” but this is not correct. I have introduced Katō Yoshiaki – one of the so-called “Seven Spears of Shizugatake” – in this story. 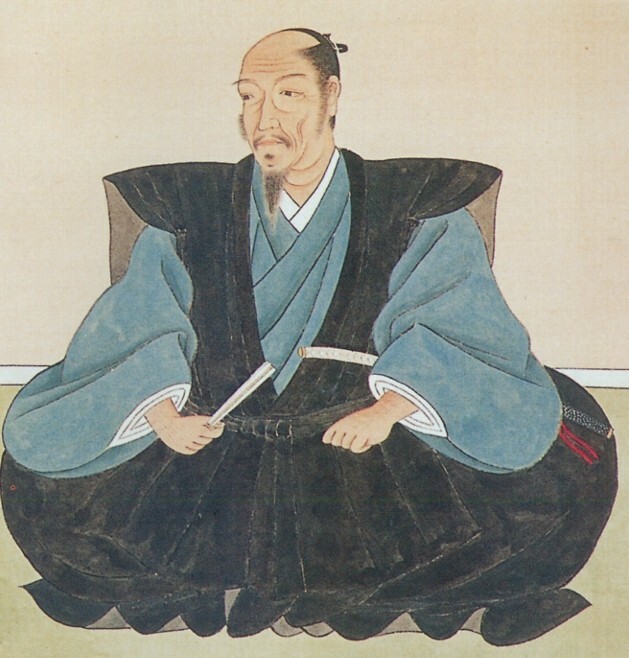 Another of those shichi-hon yari was Katō Kiyomasa (加藤清正, 1562-1611), who in turn was introduced in chapter 14. *1 Tradition says that Kiyomasa wielded in the Battle of Shizugatake a Shimosaka-school (下坂) jūmonji-yari (十文字槍), a cross-shaped yari which looks very similar to a partisan. Kihara Tateomi (木原楯臣, 1805-1868), a samurai of Higo´s Kumamoto fief (熊本藩) and an expert on court etiquette, depicts in his work Tōken Zusetsu (刀剣図説) a drawing of this jūmonji-yari (see picture below). According to Kihara, the piece was later in the possession of the Nakagawa family (中川), the lords of Oka Castle (岡城) in Bungo province. The signature of the piece in question reads: “Shimosaka-jū ?? – Katō Toranosuke” (下坂住◯◯・ 加藤虎介). Toranosuke (虎之助) – Kihara quotes the signature without the particle no (之) – was the first name Kiyomasa used until he received the honorary title Kazue no Kami (主計頭) in Tenshō 13 (天正, 1585). This means that the jūmonji-yari must have been forged before that year. Unfortunately, the signature is illegible after “Shimosaka-jū,” but there is another ōmi-yari (大身槍) preserved in Kumamoto´s Honmyō-ji (本妙寺) whose provenance says that it was also worn by Kiyomasa during the Battle of Shizugataka. This yari has a blade length of 53.0 cm and bears the signature “Shimosaka-jū Kanemitsu” (下坂住兼光). So it is possible that the jūmonji-yari too goes back to the hand of this smith. But there remains a certain problem, namely that the eldest Shimosaka smith with the name Kanemitsu who is found in the records worked around Kan´ei (寛永, 1624-1644), i.e. considerably later than Shizugatake. In short, the signature on both yari have to be treated with caution. The statue in front of the Honmyō-ji with his katakama-yari. Let us now turn to Kiyomasa’s career as a warrior. In the Edo-period chronicle on his life Kiyomasa Ki (清正記) it is mentioned that he fought his first battle at the age of 20 (according to the Japanese way of counting years). This was an attack on Tottori Castle (鳥取城) in the ninth year of Tenshō (天正, 1581). The chronicle says that he did a good job with his hankyū (半弓, a smaller bow) and his katana. 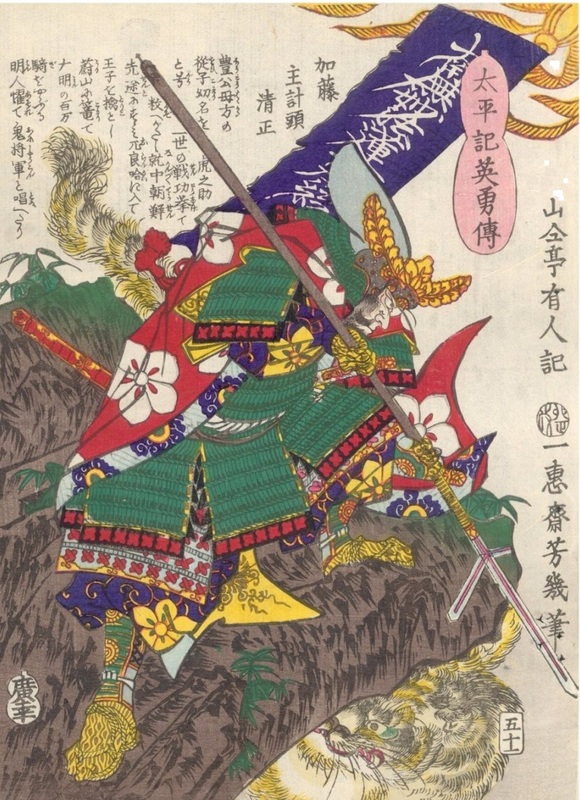 Interestingly, the Kiyomasa Ki mentions that Kiyomasa wore a jūmonji-yari in his very next battle, which was against Bitchū´s Kanmuriyama Castle (冠山城), in the spring of Tenshō ten (1582). During the attacks on Ise´s Kameyama Castle (亀山城) the following year (1583), Hideyoshi promoted him to his vanguard as a kind of baptism of fire. Kiyomasa was confronted with a line of teppō which he approached sideways, mounted and wielding a 3 m yari to push down the barrels from a distance. 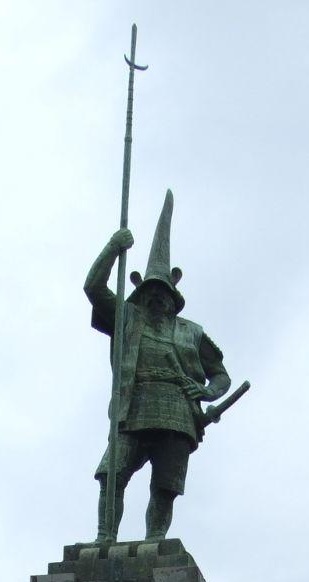 Doing so, he quickly brought the tip of his spear back to a striking position and pierced the enemy commander Ōmi Shinshichi (近江新七) through his shoulder. Some years after the Battle of Shizugatake, to be more precise in the 17th year of Tenshō (1589), Katō Kiyomasa was ordered to Kyūshū where some uprisings had started after Hideyoshi had stabilized the situation somewhat earlier. In a skirmish he faced the Higo general Kimura Danjō Masachika (木山弾正正親, ?-1589). The Kiyomasa Ki says that Kiyomasa bore a jūmonji-yari, Danjō a bow. Because the weapons were obviously unequal, Kiyomasa suggested to duel with swords and slowly lowered his spear. But when Danjō laid aside his bow, Kiyomasa quickly grasped his yari again with both hands and killed him. The chronicle says that a tip of his spear broke during this incident, which actually transformed the piece into a so-called katakama-yari (片鎌槍). According to the Buhenbanashi Kikigaki (武辺咄聞書), Kiyomasa later offered the damaged spear to the shrine which was erected on the Bukkizaka (仏木坂), the hill on which the “duel” took place. It is said that the jūmonji-yari was a work of Shizu Saburō Kaneuji (志津三郎兼氏) and that the scabbard was covered with bear fur over the area of the main blade and with black wool (rasha, 羅紗) at the tips. But there exists another version of this tradition where Danjō wrestled Kiyomasa down onto his shoulders and started to cut off his head. When his men reached the peak of the Bukizaka they could not grasp the situation because of the dust the two fighters had whirled up. One of them shouted “Milord, are you the one on top or the one on the ground?” Kiyomasa made use of Danjō´stutter and answered first: “I am the one on the ground!” And so it came – according to that version of the tradition – that Danjō on the top was killed by his own men. Well, the later version of the Kiyomasa chronicle called Zokusen Kiyomasa Ki (続撰清正記) says that Danjō challenged Kiyomasa with an ōmi-yari but that it was easy for the latter to keep Danjō in check with the lateral blade of his katakama-yari. The document mentions that the blade bent during the fight but Kiyomasa was later able to bring it back to its original position on an azalea trunk before he killed the oncoming enemies. Another publication, the Kawasumi Taikō Ki (川角太閤記) – which is an early Edo-period collection of anecdotes about Hideyoshi – writes that Kiyomasa’s yari was old and that it became loose at the kuchigane (口金), the metal collar at the upper end of the shaft. And, with the force of the enemy blows, the entire blade section eventually broke off from the tang. 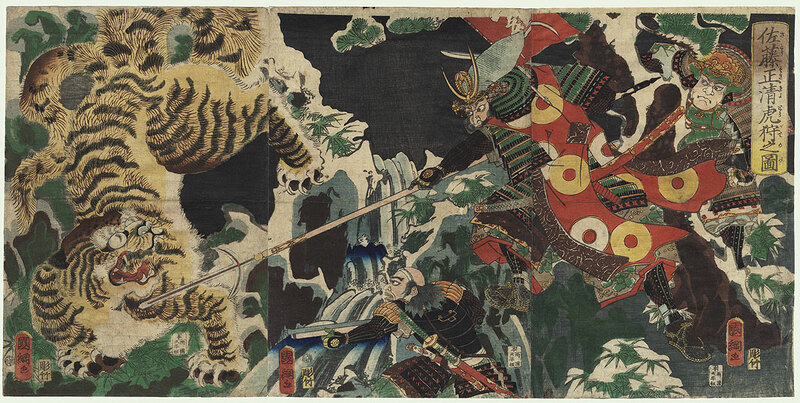 Legendary of course is also Katō Kiyomasa’s tiger hunt with a katakama-yari during the Korean campaigns. Before I introduce the latter piece I present on the following pages some interpretations by various artists of this famous subject. A theory says that the katakama-yari Kiyomasa used in Korea was originally a jūmonji-yari of which a tiger bit off one of the lateral blades. But the piece preserved today in the Tōkyō National Museum (see picture below) clearly proves, because of its forging structure and hardening, that it had always been a katakama-yari. With the marriage of Kiyomasa´s fifth daughter Yasohime (八十姫, 1601-1666)*2 to Tokugawa Yorinobu (徳川頼宣, 1602-1671) the blade went as a dowry into the Kii branch of the Tokugawa. Together with the yari the larger of the two tiger skulls brought back by Kiyomasa from Korea (see picture below) also went into the possession of the Kii-Tokugawa. The smaller one was presented to the Abe family (阿部). Kiyomasa´s katakama-yari (Tōkyō Natioal Museum). The two extant tiger skulls. Another part of this dowry was a blade by master smith Horikawa Kunihiro (堀川国広, see picture below) which was worn by Kiyomasa himself. 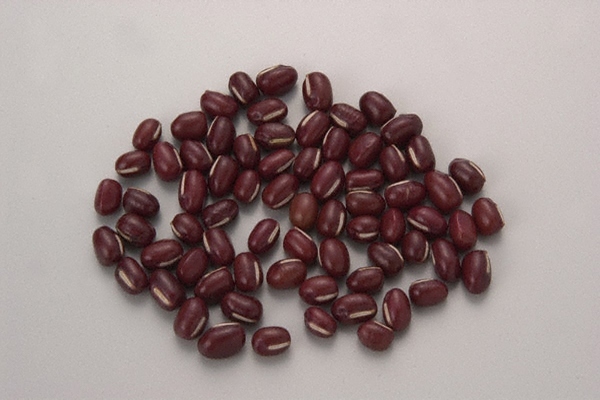 It bears therefore the nickname Katō-Kunihiro (加藤国広) and was sold at the beginning of the Shōwa era, i.e. the late 1920´s, by the Kii-Tokugawa. The buyer back then was baron Mitsui Takakimi (三井高公, 1895-1992). Today the blade is designated jūyō-bunkazai and is owned by Tōkyō´s Mitsui Memorial Museum (三井記念美術館). In the third month of the 16th year of Keichō (慶長, 1611), Tokugawa Ieyasu and Toyotomi Hideyori met in Nijō Castle (二条城), in Kyōto, to negotiate an agreement between both families. Katō Kiyomasa was invited to this gathering as one of the major advisers. When the negotiations again failed to conclude, Kiyomasa, tired and seeing his end near, approached Hideyori: “I have known you since you were in your mother´s womb. Now it is time to say goodbye, it is sad that this is the first time I show you my appreciation with this present!” He opened his bag and gave Hideyori a tantō in tears. 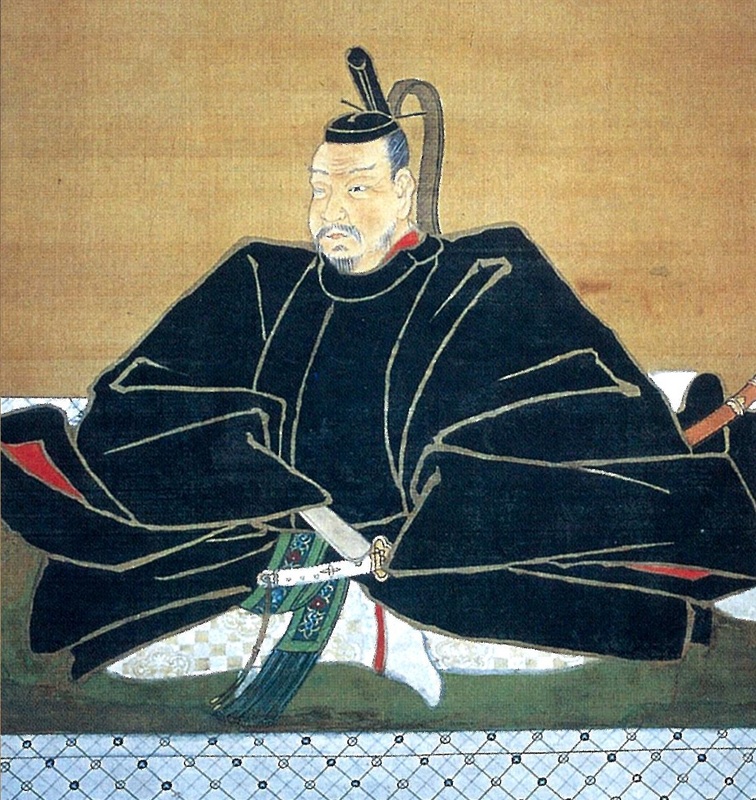 Kiyomasa had probably realized that the conflict between Ieyasu and Hideyori would end in bloodshed, which was actually true when Ōsaka Castle was besieged three years later. On his journey home to Higo Kiyomasa became ill and died in Kumamoto on the 24th day of the sixth month of the same year. The tantō he presented to Hideyori is still extant today (see picture below). It is a work of Osafune Sukesada and bears the signature: “Bishū Osafune Sukesada saku – Eishō jūsannen nigatsu-hi” (備州長船 祐定作・永正十三年二月日, “a day in the second month of Eishō 13 ”). The blade is mounted with an unobtrusive and very tasteful koshirae. The lower half of the saya is interpreted as bamboo wickerwork (ajiro, 網代). The hilt is unwrapped, has a rough lacquer finish and shows menuki in the form of horsetail. Today this style of mounting is called Katō-kō-goshirae (加藤公拵) or Kiyomasa-goshirae (清正拵). The piece is owned by Higo´s Honmyō-ji in which Kiyomasa is buried and is preserved in the Kumamoto Prefectural Museum of Art (熊本県立美術館). *1 Yoshiaki and Kiyomasa belonged to two different branches of the Katō and were not blood related. *2 Her later name was Yōrin´in (瑤林院). Once the poet Chōmu (蝶夢)*1 compiled in the first year of Jōkyō (貞享, 1684) a provenance for the Tsurumaru-Kuninaga (鶴丸国永) which says that it was once worn by Taira no Koremochi´s (平維茂) grandson Jō Tarō Sadashige (城太郎貞茂). In Eishō six (永承, 1051) Koremochi´s son Shigemochi (繁茂) assumed the office of Dewa Jōnosuke (出羽城介), i.e. he became the governor of Dewa and Akita province. So the logic explanation would be that the Tsurumaru-Kuninaga was in the Jō family until the Mongol Invasion and that the Murakami or Seino family owned a different blade by the same smith. However, after the fall of the Hōjō in the last years of the Kamakura period, the trace of the sword is lost again. It pops up again on surface more than 200 years later in the possession of Oda Nobunaga who presented it to one of his retainers called Mimaki Kanbei (三牧勘兵衛). Kanbei had no son so he gave the sword to his daughter as a dowry when she married into the Matsuda family (松田). This daughter bequeathed it to her lastborn, one and only son, Sokai (素懐) who was a priest. Sokai was well educated and took on the task to find out more about the treasure sword of his family. So he took it to the Hon´ami family who, to his surprise, asked him: “Your blade reminds us very much of the meibutsu Tsurumaru of the Hōjō family. Do you have any accompanying documents about the provenance of your piece?” Immediately Sokai visited his family and searched the entire residence for any useful records. And indeed, he discovered a letter by Akechi Mitsuhide in an old chest which mentioned that the sword in question was in the possession of Nobunaga and that it had been handed down through the generations within the Hōjō family. This was the proof that the blade was the Tsurumaru-Kuninaga and so Sokai visited the aforementioned Chōmu and ordered a fine and clean calligraphic copy of the provenance of the sword. The “rediscovery” of the famous sword made the rounds and so it came that the Date family bought it through the agency of the Hon´ami. The price was probably around 200 gold pieces because this was the value which was issued on the contemporary origami from the 16th year of Genroku (元禄, 1703). The sword became one of the most precious treasure swords of the Date and was later presented to emperor Meiji when he visited Sendai in 1876. Let us now turn to the nickname of the piece. The Kyōhō Meibutsu Chō mentions briefly: “Details on the name Tsurumaru are unknown.” In the Date sword chronicle Go TōkenKi we read: “Habaki ni rindō o sukasu. Yotte, ´Rindō´ to nazuke. Mata Tsurumaru to gō-su.” (鎺ニ輪当を隠す。依而、利不動と名付。又鶴丸と号す), which translates as „The habaki*2 shows sukashi openings in the form of a rindō (竜胆, Japanese gentian, Gentiana scabra). Therefore [the blade] is called Rindō (利不動). 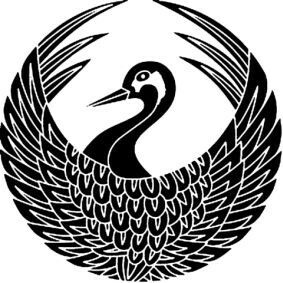 But there is also the nickname Tsurumaru (鶴丸).” It is safe to assume that the Japanese gentian was interpreted in its form as a family crest (see picture below). Interesting is that two different writings (輪当・利不動) were used in this entry for rindō (竜胆). The Muromachi-era sword script Takeya Kizō Nyūdō Mekiki Sho (武谷喜三入道目利書) speculates on the name Tsurumaru that during the Hōgen Rebellion (Hōgen no ran, 保元の乱), i.e. around 1156, the aforementioned Murakami Tarō had the sword mounted in a koshirae with family crests in the shape of a crane in the round (Jap. tsurumaru, see picture above). This crest was a popular and auspicious decorative element for fittings and, first and foremost, for tachi saya of the early and mid Kamakura period. This can be backed-up by extant pieces. For example, on a sword which was offered by Fujiwara no Yoritsune (藤原頼経, 1218-1256) in the first year of Ninji (仁治, 1240) to the Itsukushima-jinja (厳島神社), or on a tachi that belonged to Minamoto no Yoshitsune (源義経, 1159-1189) and which is preserved in the Kurama-dera (鞍馬寺). Most experts today follow the approach of the Takeya Kizō Nyūdō Mekiki Sho, this means that the name of the sword goes back to its original scabbard ornamentation and that somewhat later another mounting was made whose fittings featured the rindō crest. The swordsmith Kuninaga by the way dates to around the Tengi (天喜, 1053-1058) era. He was according to tradition the younger brother or son of Gojō Kanenaga (五条兼永) and he lived in the Bōmon district (坊門) in the vicinity of Kyōto’s Gojō axis (五条). *1 Because of this date it can´t be the famous Chōmu (1732-1796) of the same name. *2 This was the original habaki, i.e. the former piece before the Date family had ordered a new tachi-koshirae. 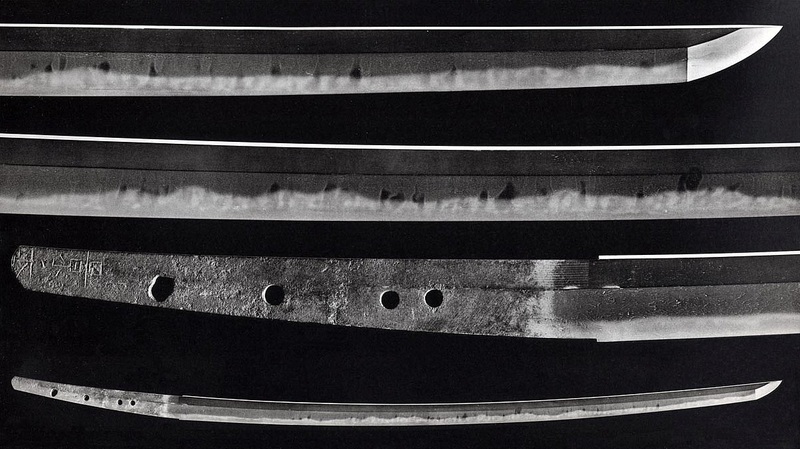 *3 Of course, the Mikazuki-Munechika (三日月宗近) is older, but from the point of view of perfection of forging technique and condition, the Tsurumaru-Kuninaga is clearly superior to the Mikazuki-Munechika. I like to tell you about the tragic love story of the swordsmith Hosokawa Tadamasa (細川忠正). Tadamasa was born in the eighth year of Tenpō (天保, 1837), the eldest son of Hosokawa Tadayoshi (忠義) who worked for Shimōsa´s Sakura fief (佐倉藩) which was ruled by the Hotta family (堀田). Tadayoshi in turn was the second son of the famous master Hosokawa Chikaranosuke Masayoshi (細川主税佐正義). Already in his early years Tadamasa was introduced to the craft of sword forging by his father and there exists a joint work of father and son from the third year of Kaei (嘉永, 1850), when Tadamasa was only 14 years old (according to the Japanese way of counting years). But ten years later he ended up in distant Kyūshū, to be more precise, in the castle town of Nobeoka (延岡) in Hyūga province. There is a blade extant which he made in the eighth month of the first year of Man´en (万延, 1860) for Kondō Daiyū (近藤大夫), one of the elders of the Nobeoka fief of the same name. Thereupon he was hired by the fief which was ruled by the Naitō family (内藤). It is said that Tadamasa was a giant and was very arrogant, who boasted everywhere of his great skills. This, and the fact that he was insufferable when he was drunk, did not exactly make him one of the most popular contemporaries. He even fell out with Kondō who was one of his few customers who adored his work. So he wandered through Hyūga with no particular destination. One of his stations was the small Sadoawara fief (佐土原藩) which was a branch fief of the powerful Satsuma fief (薩摩藩). The samurai serving there had not much money and were therefore not able to pay the 10 ryō Tadamasa asked for a long sword. They finally agreed upon free board and lodging as “payment” and they tried hard so that the smith didn’t lack of anything. When Shimazu Tadahira (島津忠寛, 1828-1896), the last daimyō of the Sadowara fief, supported the Satsuma Rebellion in Keiō four (慶応, 1868) with 500 men, it is said that many of the blades worn by these warriors were works of Tadamasa. After that he visited the southern village of Takaoka (高岡), but the arrogant stranger caused problems from the beginning. The young samurai of the village decided one night to kill the swordsmith but he somehow heard about the conspiracy and was able to escape in a cloak-and-dagger operation via a stopover in Miyakonojō (都城) to the further south Obi fief (飫肥藩). There the daimyō of the fief, the Itō (伊東), hired him as a swordsmith in the second year of Keiō (1866). In Obi he met Toku (登久), the daughter of a certain Matsuda Kaku´emon (松田覚右衛門), who came from the neighbouring village of Maezuru (前鶴). It was love at first sight. Toku too did not have a good reputation. She was considered as being arrogant, egoistic, nymphomaniac and faithless, that means she was a “perfect match” for Tadamasa. But her father Kaku´emon was against their relationship and strictly against a marriage. So they lived in separate houses during the day and met secretly at night. One balmy May night the secretiveness was too much for Tadamasa and he broke, completely drunk, into the house of Kaku´emon to demand the surrender of his daughter. A fight broke out and Tadamasa started to riot. The incident became public and, in the end, Toku was regarded the most impious and disrespectful towards her father. The fief official ordered that her hair be shaved and arranged a committal to a special prison for sick and juvenile offenders in Edo. When she became aware of her desperate situation she cut her throat with a razor thirteen days after the incident at her father´s house and bled to death. Devastated, Tadamasa submitted a written application at the fief for a leave of abscence. The same night this was granted he disappeared to an unknown destination. Two months later he wrote two letters to retainers of the Obi fief but then his trace disappears. His name pops up again, on surface only, in the fifth year of Meiji (1872) when everybody had to register in the course of the new personal statute law. At that time he was staying at the Takanabe fief (高鍋藩) which had actually been dissolved the previous year. He had already visited the fief in earlier years when it was ruled by the Akizuki family (秋月). Tadamasa´s year of death is unknown but the latest extant signature with a date is from the second month of the 29th year of Meiji (1896).